O Mary Immaculate, gracious Queen of Heaven and of Earth, behold us prostrate before thy exalted throne. Full of confidence in thy goodness and in thy boundless power, we beseech thee to turn a pitying glance upon Palestine, which, more than any other country, belongs to thee, since thou hast graced it with thy birth, thy virtues and thy sorrows, and from there hast given the Redeemer to the world. Remember that there especially thou wast constituted our tender Mother, the dispenser of graces. Watch, therefore, with special protection over thy native country, dispel from it the shades of error, for it was there that the Son of Eternal Justice shone. Bring about the speedy fulfillment of the promise, which issued from the lips of thy Divine Son, that there should be one fold and one Shepherd. For some history on this beautiful prayer, please visit here. In 1948, Pope Pius XII outlined the only plan for true peace in the Holy Land: prayer to Our Lady. The Vicar of Christ was not listened to, Catholics did not pray for peace. Thus, war and rumours of war surround the Holy Land. With both sides in this blood feud becoming brutalized and desensitized from decades of violence and slaughter, the end does not look good. There will be NO peace, as both sides reject the Prince of Peace. It is only a matter of time when the Man of Perdition (who will be a Jew according to the Fathers) will walk into the Temple, and make "peace". He will be the Antichrist. But there is another special reason today which brings affliction and keen anxiety to our hearts. We mean to refer to the Holy Places of Palestine, which have long been disturbed. Indeed, if there exists any place that ought to be most dear to every cultured person, surely it is Palestine, where, from the dawn of antiquity, such great light of truth shone for all men, where the Word of God made flesh announced, through the angels’ choir, peace to all men; where, finally, Christ hanging on the Cross acquired salvation for all mankind, with arms outstretched as if He were inviting all nations to fraternal harmony; and where He consecrated His precept of charity with the shedding of His blood. 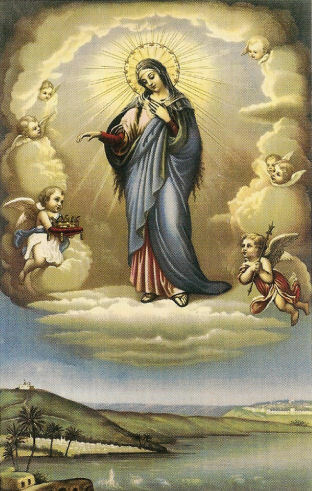 We desire, therefore, Venerable Brethren, that supplications be poured forth to the Most Holy Virgin for this request: that the situation in Palestine may at long last be settled justly and thereby concord and peace be also happily established. We place great confidence in the most powerful patronage of Our Heavenly Mother — a patronage which, during this month dedicated to her, innocent children especially will implore in a holy crusade of prayer.